Seven months to the day after their thrilling victory in Super Bowl XLVI, the New York Giants’ title defense began with a fizzle. After falling behind late in the game, the Giants were unable to muster up the same heroics that helped win them the Lombardi Trophy last season and fell to the Cowboys 24-17. Here’s a breakdown of some of the game’s key players and how they performed. 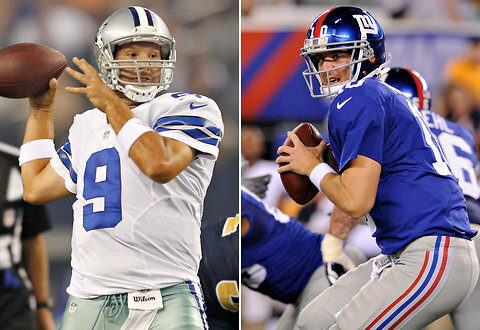 Tony Romo bested Eli Manning in Wednesday’s season opener between the heated rivals. Commentators Chris Collinsworth and Al Michaels remarked during the telecast that this may have been Romo’s best game of his career. Statistically, that one interception might prevent this game from being his best day, but from a game-management standpoint, Romo was near flawless. He controlled the game from start to finish, reading New York’s defense, changing the play at the line of scrimmage and finding ways to exploit the Giants’ depleted secondary. Murray picked up where he left off before his injury last season with another excellent game running the ball. The most impressive part of his game was his consistency. It seemed like each attempt he was able to push forward for a significant gain, even when it seemed no holes were open. His 6.6 yard average forced New York to keep more defenders in the box, which in turn opened up passing lanes for Romo to hit his receivers. 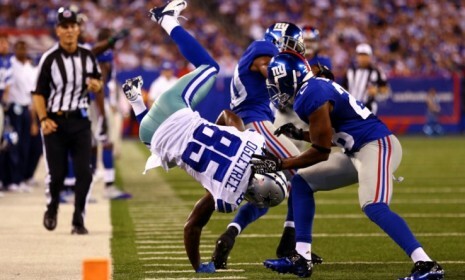 Kevin Ogletree ran – and somesaulted – past the Giants’ defense on his way to a career game. In his previous 31 NFL games, Ogletree combined for 25 catches, 294 yards and 0 touchdowns. His breakout game last night came as a huge surprise, given his prior numbers in the league. In one game he compiled around a third of his career reception and yard statistics. His first two career TDs were just icing on the cake. For a Dallas team thatalready has two stud receivers in Miles Austin and Dez Bryant, if Ogletree can remain a consistant target, the Cowboys could be an incredibly tough team to defend. While Eli didn’t struggle, his performance was far from dazzling. He took care of the ball, but didn’t work the ball down the field as effortlessly as Romo. It took until the third quarter for New York to really get some momentum going on offense. A lot of this was out of Manning’s hands, with some shoddy play by his receivers, excellent coverage by Dallas’ secondary, constant pressure from DeMarcus Ware and the Cowboys D-Line, and an inconsistant ground game for the Giants. With all these factors, Eli wasn’t able to control the game as well as we’ve become accustomed to. Like Manning, Bradshaw didn’t have a bad game, yet it still wasn’t all that great. He really struggled to gain consistant yardage on the ground. Excluding his longest run of 33 yards, Bradshaw averaged less than 3 yards per carry. This produced the opposite effect that Murray had for the Cowboys. With Bradshaw unable to put pressure on the Dallas defense, the Cowboys didn’t have to worry too much about the run game and could focus on stopping Manning’s passing attack. 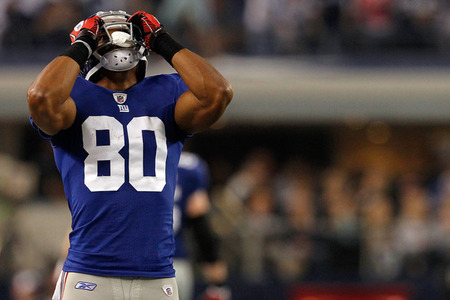 Victor Cruz’s struggles catching the ball hurt the Giants in their 24-17 loss to the Cowboys. The theme of the night for the Giants was inconsistency and Cruz was a big cause of that. After being among the leading receivers a year ago, Cruz did not look the part Wednesday night with three dropped passes. And they were pretty bad drops, with no defenders even near him. For an elite receiver that is inexcusable. Cruz still led the team in catches and yards, but came down with just 6 receptions despite being thrown to 11 times. That’s not a great start to the season for him and it really hurt his team. Just How Bad Did Roger Goodell and The NFL Screw Up?